According to United Nations Conference on Trade and Development’s (UNCTAD) latest World Investment Report, from 2016 to 2017, global foreign direct investment (FDI) flows decreased by 23 percent from $1.87 trillion to $1.43 trillion—despite an increase in global gross domestic product (GDP) growth and trade during this time. The report indicates that a decrease in cross-border mergers and acquisitions (M&As) from 2016 to 2017 contributed significantly to the decline in overall FDI. However, the relative decline in M&As in 2017 was not unexpected, considering that 2016 was characterized by several one-off megadeals of over $30 billion—including foreign acquisitions of U.K.-based companies SABMiller, BG Group, and ARM, as well as U.S.-based firms Allergan PLC and Baxalta Inc., among others. African FDI inflows comprised 2.9 percent of global FDI inflows in 2017, compared to the 49.8 percent share for developed economies, 33.3 percent share for developing Asia, and 10.6 percent share for Latin America and the Caribbean. In line with the decline in global FDI flows, FDI flows to Africa similarly slumped by 21.5 percent from $53 billion in 2016 to $42 billion in 2017. The report shows that African FDI inflows have continued to contract since 2015 due in large part to the lingering macroeconomic effects of the 2014-2016 oil price slump, with flows to commodity-exporting countries declining more so than to diversified economies (Figure 1). Source: UNCTAD World Investment Report, 2018. 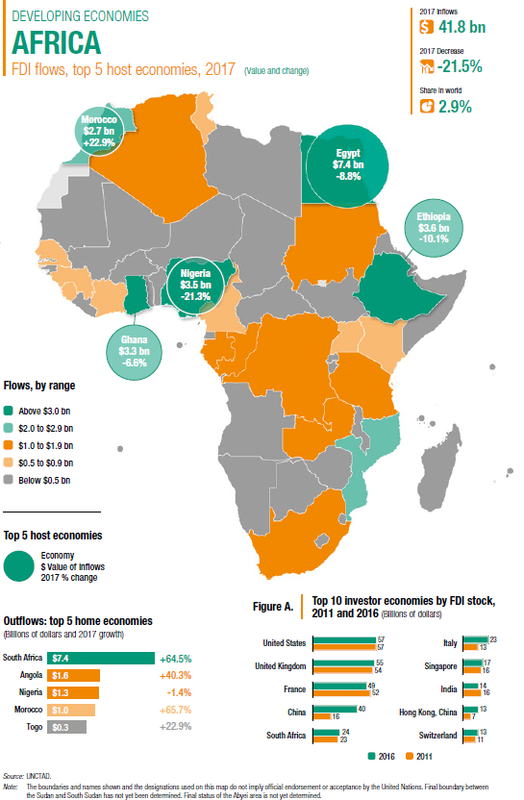 Africa’s top destinations for FDI inflows in 2017 were Egypt ($7.4 billion), Ethiopia ($3.6 billion), Nigeria ($3.5 billion), Ghana ($3.3 billion), and Morocco ($2.7 billion). It is worth noting that, of these top FDI destination economies, only Morocco experienced an increase in FDI from 2016 to 2017 (of 22.9 percent) while the rest of these economies saw declines. The influx of FDI to Morocco stems from a series of deals related the country’s auto industry and new car technologies, as well as Chinese investment in the banking sector. Meanwhile, the top countries from which FDI flows originated were South Africa ($7.4 billion), Angola ($1.6 billion), Nigeria ($1.3 billion), Morocco ($1.0 billion), and Togo ($0.3 billion). South Africa led the region in FDI outflows as South African retailers and Standard Bank expanded into Namibia, and the South African “Africa Private Equity Fund” of Investec made several intra-African acquisitions. According to Figure 2, the region’s top investors in 2016, in terms of FDI stock in African countries, were the U.S. ($57 billion), the U.K. ($55 billion), France ($49 billion), China ($40 billion), and South Africa ($24 billion). Announced greenfield investment in Africa amounted to $85 billion in 2017, down from $94 billion in 2016. Greenfield FDI projects in the services sector received the most investment at nearly $54 billion (particularly in electricity, gas, and water, which accounted for $37 billion in investment), followed by the manufacturing sector with $21 billion, and the primary sector with almost $11 billion. Moving forward, the report suggests that African FDI inflows may strengthen by 20 percent in 2018—to $50 billion—as commodity-exporting economies continue to recover from the commodity price slump. Without government support to promote economic diversification in these economies, however, commodity dependence in the region will cause FDI to remain cyclical and trapped in “commodity enclaves,” where it has fewer positive spillovers in terms of technology transfer and promoting linkages with domestic suppliers, according to the report. On another note, the report argues that as the implementation of the African Continental Free Trade Area (AfCFTA) agreement progresses, market-seeking FDI is also expected to pick up in the region, barring unforeseen downturns in the global policy environment.